You've made it to another Monday! Whether it was spent at home or abroad, I hope that you had a wonderful weekend. Let's take a look at the Walt Disney World News from last week. I wouldn't want you to have missed anything. 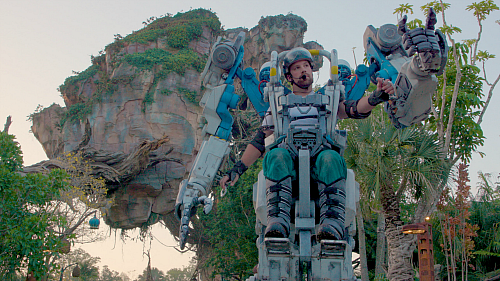 In Pandora - The World of Avatar at Disney's Animal Kingdom, a towering mechanical suit with its pilot strapped into the cockpit 10 feet above the ground will begin roaming the land beginning April 22nd. Through this exciting bit of streetmosphere guests will learn details about the land's otherworldly landscape and highlighting the importance of preserving nature. Over in DinoLand USA, Donald Duck has discovered that his ancestors were actually dinosaurs! Starting May 25, 2018, the whole land will be transformed with bright and festive decor, and guests will be able to interact with Donald himself, Daisy, Goofy, Pluto, Chip, Dale, and Launchpad McQuack! All of the characters dressed in their celebratory best of course. Its sure to be a celebration for the ages. Agent P's World Showcase Adventure at Epcot received a bit of an upgrade thanks to the MyDisneyExperience App. If you have your app open at certain points in the Park (near the Future World bridge, International Gateway, or Mexico bridge) will now get alerts from Major Monogram recruiting them to help stop the evil Dr. Doofenshmirtz. In Disney Resorts news, guests at Disney's Wilderness Lodge will be the first to be able to use a new digital key option to access their rooms, and secured guest areas. The digital key feature will be available on Bluetooth-enabled mobile devices that have the latest version of the My Disney Experience app installed. The feature will be expand to other Disney Resort hotels over the coming months. Get more details in the video below. And one last bit... shopDisney debuted a fun collection of kitchen gear called "Disney Eats" that will brighten up your home cooking routine. So if you want to add some character to your meal prep be sure to check it out! What Disney fun do you have in store this week, anything? Leave a comment below and tell me how you bring magic into your week. Planning for an up coming trip here! I would sooooo love that mechanical suit to be a ride!! Hahaha. Since we can't get FPs to Flight of Passage (totally booked!) we are researching other strategies, such as arriving at AK an hour before opening and getting in line.